You can use normal Raspi 2/3 too! There are many IoT automation projects out there, but trust me there is nothing like this! Octopod is made using NodeMCU (MAX32620FTHR or Arduino MKR 1010), Arduino Uno, and Raspberry Pi 3. Octopod allows you to make your home smart. Octopod sends you a variety of data like temperature, humidity, and gas quality inside your home/office/ industry. Octopod sends you notification whenever it detects any sort of motion inside and tells you when you need to water your plants. You can also control your appliances through a Blynk application on your smartphone. Octopod even enables true mood lighting! 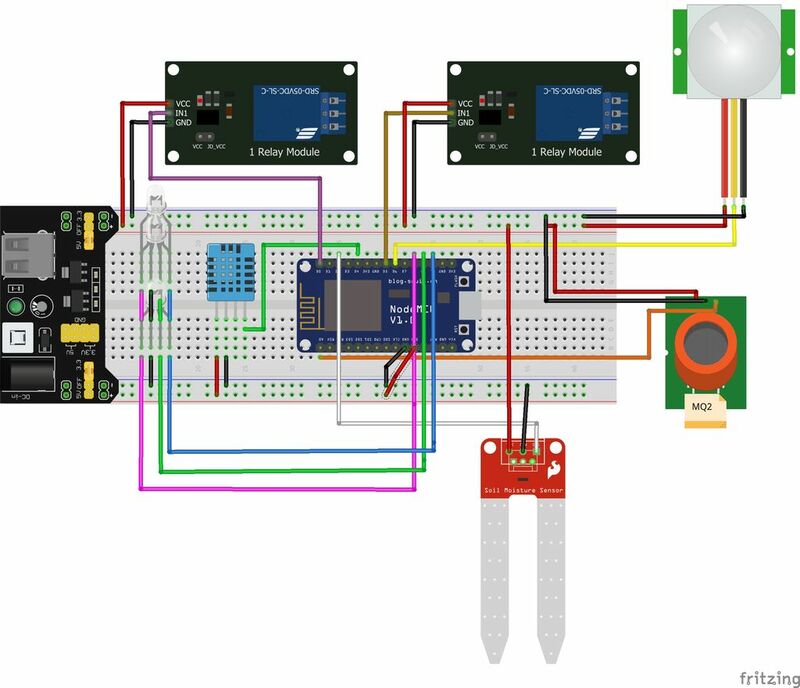 This code uses 2 main libraries, the Blynk Library to make the code compatible to the Blynk Application and the the other library is the DHT11 Temperature Library, which converts the raw data from the sensor into Temperature and Humidity. To download these libraries, just go to the given links in the code and download them. Then head to Arduino IDE → Sketch → Include library → Add .zip library, and select your downloaded libraries. This is some Blynk code that helps you connect your nodemcu to the internet and then authenticate it to your app. With this code we tell the Blynk app that it can use Pin V0 and Pin V1 to tell the code if Motion Detection and Soil Moisture test are turned ON. Reads the digital value from the sensors, then it runs an if- else condition to check the state of the sensor. If the sensor is in required state, it pushes a notification from the Blynk App. In the loop we write things that are to be done over and over. Here, we make sure that the code that we wrote before setup runs. Then, we write 2 If- Else Statements that check the states of the Pin V0 and Pin V1 and then take the values from the sensors accordingly. To be honest this is a simple and easy Code and doesn't need much explanation. But, I will still tell you in a nutshell what this does. There are two versions of the code, one is if you want to connect the door unit box to Bluetooth so it tells you when your door is open via the serial terminal. Other sends to serial so it can be viewed if you connect your Arduino to your computer. I prefer simple without Bluetooth version though . So here we go! Go to Sketch → Include Library → Manage Library → Type in the search bar MFRC522 and install the library. Then go File → Examples → Custom Libraries → MFRC522 → dumpInfo Sketch. In the starting you can read how to connect pins (Or refer the picture). Then run the code and open serial monitor and bring one your Rfid Card in front of the MFRC522 Module and wait for 5 second. Then, note the card UID in a similar manner note the UID's of your other cards and Key Chains. In this code there are two main things that we do, that is in If- Else part of the code. 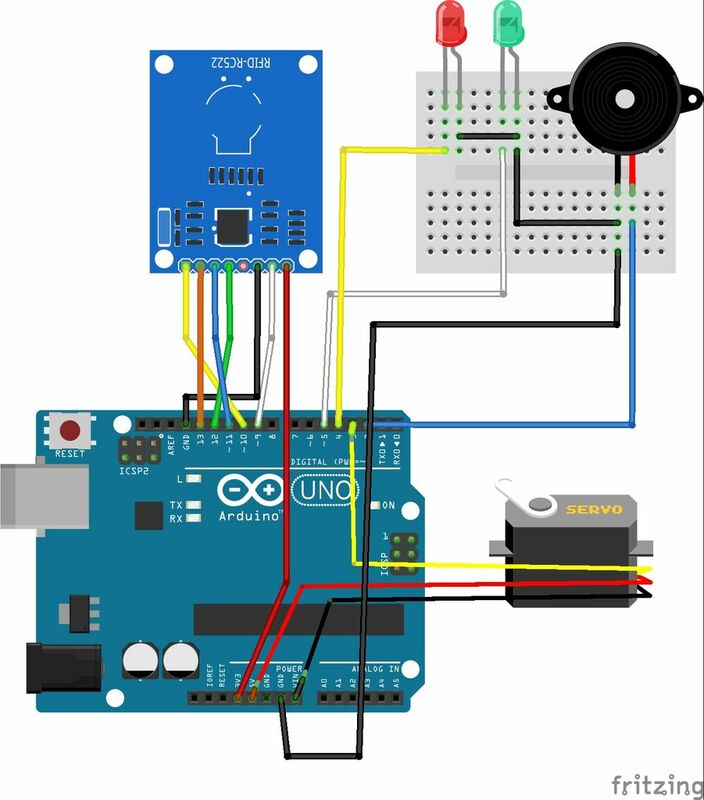 In if we tell the arduino that if the the UID of the card matches to the UID mentioned make the Servo move (So that the Door Opens) and blinks some Led's and make some sounds by using the buzzer. Else if the UID's don't make blink some led's and make some sounds by using the Buzzer. In this guided step we are going to learn how to make a Smart Security Camera. The camera will send you An Email whenever it detects the object and If you are on the same WiFi network you can access the live footage by the camera by typing the IP address of your Raspberry Pi. I will show you how to create the smart camera from scratch. Let's go! 1. Raspberry Pi 3 with Raspbian Stretch installed. If you don’t already have the Raspbian Stretch OS, you’ll need to upgrade your OS to take advantage of Raspbian Stretch’s new features. To upgrade your Raspberry Pi 3 to Raspbian Stretch, you may download it here and follow these upgrade instructions (or these for the NOOBS route which is recommended for beginners). Note: If you are upgrading your Raspberry Pi 3 from Raspbian Jessie to Raspbian Stretch, there is the potential for problems. Proceed at your own risk, and consult the Raspberry Pi forums for help. Important: It is my recommendation that you proceed with a fresh install of Raspbian Stretch! Upgrading from Raspbian Jessie is not recommended. 2. Physical access to your Raspberry Pi 3 so that you can open up a terminal and execute commandsRemote access via SSH or VNC. I’ll be doing the majority of this tutorial via SSH, but as long as you have access to a terminal, you can easily follow along. I finished this project almost in 5 Hrs. Installation Of Open CV took almost 3 Hrs. If this is your first time installing OpenCV or you are just getting started with Rasbian Stretch. This is the perfect tutorial for you. After removing the Wolfram Engine and LibreOffice, you can reclaim almost 1GB! You may get a message that pip is already up to date when issuing these commands, but it is best not to skip this step. If you’re a longtime PyImageSearch reader, then you’ll know that I’m a huge fan of both virtualenv and virtualenvwrapper. Installing these packages is not a requirement and you can absolutely get OpenCV installed without them, but that said, I highly recommend you install them as other existing PyImageSearch tutorials (as well as future tutorials) also leverage Python virtual environments. I’ll also be assuming that you have both virtualenv and virtualenvwrapperinstalled throughout the remainder of this guide. So, given that, what’s the point of using virtualenv and virtualenvwrapper ? First, it’s important to understand that a virtual environment is a special tool used to keep the dependencies required by different projects in separate places by creating isolated, independentPython environments for each of them. In short, it solves the “Project X depends on version 1.x, but Project Y needs 4.x” dilemma. Now that we have our ~/.profile updated, we need to reload it to make sure the changes take affect. You can force a reload of your ~/.profile file by: Logging out and then logging back in. This command will create a new Python virtual environment named cv using Python 2.7. Again, I can’t stress this point enough: the cv Python virtual environment is entirely independent and sequestered from the default Python version included in the download of Raspbian Stretch. Any Python packages in the global site-packages directory will not be available to the cv virtual environment. Similarly, any Python packages installed in site-packages of cv will not be available to the global install of Python. Keep this in mind when you’re working in your Python virtual environment and it will help avoid a lot of confusion and headaches. How to check if you’re in the “cv” virtual environment If you ever reboot your Raspberry Pi; log out and log back in; or open up a new terminal, you’ll need to use the workon command to re-access the cv virtual environment. To validate and ensure you are in the cv virtual environment, examine your command line — if you see the text (cv) preceding your prompt, then you are in the cv virtual environment: Make sure you see the “(cv)” text on your prompt, indicating that you are in the cv virtual environment. If you do not see the “(cv)” text on your prompt, then you are not in the cv virtual environment and need to run “source” and “workon” to resolve this issue. To fix this, simply execute the source and workon commands mentioned above. Installing NumPy on your Raspberry Pi Assuming you’ve made it this far, you should now be in the cv virtual environment (which you should stay in for the rest of this tutorial). the NumPy installation can take a bit of time. $ cd ~/opencv-3.3.0/   $ mkdir build $ cd build  $ cmake  -D CMAKE_BUILD_TYPE=RELEASE \                        -D CMAKE_INSTALL_PREFIX=/usr/local \                        -D INSTALL_PYTHON_EXAMPLES=ON \                         -D OPENCV_EXTRA_MODULES_PATH=~/opencv_contrib-3.3.0/modules \                       -D BUILD_EXAMPLES=ON .. Checking that Python 3 will be used when compiling OpenCV 3 for Raspbian Stretch on the Raspberry Pi 3. Notice how the Interpreter points to our python2.7 binary located in the cv virtual environment. The numpy variable also points to the NumPy installation in the cv environment. Again, the Interpreter points to our python3.5 binary located in the cv virtual environment while numpy points to our NumPy install. In either case, if you do not see the cv virtual environment in these variables paths, it’s almost certainly because you are NOT in the cv virtual environment prior to running CMake! If this is the case, access the cv virtual environment using workon cv and re-run the cmake command outlined above. Configure your swap space size before compiling Before you start the compile process, you should increase your swap space size. This enables OpenCV to compile with all four cores of the Raspberry PI without the compile hanging due to memory problems. Notice that I’ve commented out the 100MB line and added a 1024MB line. This is the secret to getting compiling with multiple cores on the Raspbian Stretch. If you skip this step, OpenCV might not compile. The -j4 switch stands for the number of cores to use when compiling OpenCV. Since we are using a Raspberry Pi 2, we’ll leverage all four cores of the processor for a faster compilation. Once OpenCV 3 has finished compiling.Our OpenCV 3 compile on Raspbian Stretch has completed successfully. We’re almost done — just a few more steps to go and you’ll be ready to use your Raspberry Pi 3 with OpenCV 3 on Raspbian Stretch. Congratulations, you now have OpenCV 3 installed on your Raspberry Pi 3 running Raspbian Stretch! But before we pop the champagne and get drunk on our victory, let’s first verify that your OpenCV installation is working properly. However, be cautious with this command! Make sure OpenCV has been properly installed on your system before blowing away these directories. A mistake here could cost you hours in compile time. Don’t forget to change your swap size back! Now, add tabs. Go to the second tab and add Twitter, Notifications, Email and Eventor. In Twitter add you twitter username and password. In Notifications, Switch on Notify when hardware goes off. In Email, set your Email address. In Eventor you can set many triggers, see the picture for the triggers that I have set up. Warning - This is going to be one of most time-consuming process! NOTE: You can skip this step and 3D print the enclosure that I have provided! Actually, this step is optional yet the most important step! You can just take a shoe box and avoid all of this hard work. But on the contrary, this hard work makes the project unique. The idea for this unique design striked me while, I was doing my math homework. This shape is inspired from an octagon. Rather, This is a 3D octagon! So let's get started! Take your cardboard and draw a rectangle of 9 cm x 9.5 cm (You can change the dimensions as per your convince). Now, joining end to end draw 4 of theses similar rectangles (8 if your cardboard is long enough). For this you need to head out towards an open area! Wear your Mask and Gloves and just make one coat over the structure that you have created. You can go to Youtube, to learn proper ways to make a perfect coat. Now let this dry for 4- 5 Hours and then apply 1 more coat. I think 3 coats will be good for this. That's it! You have arrived with a unique piece of art. Following are the sensor connections: DHT11 → D4/ GP2 MQ2 → A0/ adc00 Soil Moisture Sensor → D2/ GP4 PIR → D6/ GP1 RGB R → D8/ GP15, G → Rx/ GP3, B → Tx/ GP1 RelayLn1 → D0/ GP16, Ln2 → D5/ GP14 Make the following connections. Now, insert all these electronics inside, through any open triangle and close the triangle by using the cut outs of acrylic butter paper that we made. It is better to leave 1 or 2 open, in case something inside needs to be fixed! Also let the prongs of the Soil Moisture Sensor sit outside. All done! We have completed the making process of the Octopod! Now, Just switch On the power and keep your Octopod over the dining Table or maybe on the Guest's Table and enjoy! To see the live feed from the Raspberry Pi, just open a browser and put in the IP address of the Pi. Enjoy! I have been working on integrating this system with Amazon Alexa, I am almost done. Will upload the code in 2-3 days! This is the basic design that you can use if you want to make the enclosure out of Cardboard/ Wood like me! Proper Enclosure that you can 3D Print! I am a 17 year old who loves tech and making new things!